While the housing market has seen improvements over the past few years it is still not where it was before the 2008 recession. In order to help spur further investment in housing the government has made changes to the requirements to receive FHA loans. Now those who have a black mark on their credit history can apply for financing without sitting out the required waiting period. In the past, if an individual had a short sale, deed-in-lieu, foreclosure, or bankruptcy they would be required to wait at least three years before being eligible to receive a FHA loan. Today, with what’s known as the Back to Work Program – Extenuating Circumstances Program, individuals can apply after only waiting one year. In order to qualify for a waiver of the awaiting period, a borrower must be able to prove that over the past year they have gotten back on stable financial ground and are a low risk for future defaults. To be considered for the Back to Work Program the borrower must first be able to provide evidence that they suffered a financial hardship that led to their foreclosure or bankruptcy. This is referred to by the FHA as an economic event. It is defined as the reduction in income of at least 20% for at least six consecutive months. If a borrower is able to prove their economic event they are then required to show that they have gotten their finances back in order. If the economic hardship was the loss of employment, they must show that they are now back to work and earn an income that will allow them to make their monthly payments. Individuals must also show evidence that they had a satisfactory credit history prior to their economic event. After the economic event the buyer must show a clean payment history and lack of derogatory marks over the past twelve months. The third and final step of the FHA Back to Work program involves one-on-one counseling with an approved counselor form the Department of Housing and Urban Development. Borrowers are required to complete at least one one-house session, but additional counseling may be required depending on the individual’s circumstances. These sessions are required to take place between 6 months and 30 days before the application for the loan. While it takes some work to secure a waiver of the waiting period, being able to obtain an FHA loan comes with many benefits. One of the most appealing to borrows, especially those who have suffered recent economic hardship, is the down payment requirement. FHA loans only require borrows to put down 3.5% of the purchase price. The interest rates on FHA loans are typically very competitive, and often lower than non FHA loans. This program provides a second chance to those individuals who may have lost their home or been forced to file for bankruptcy through extenuating circumstances. 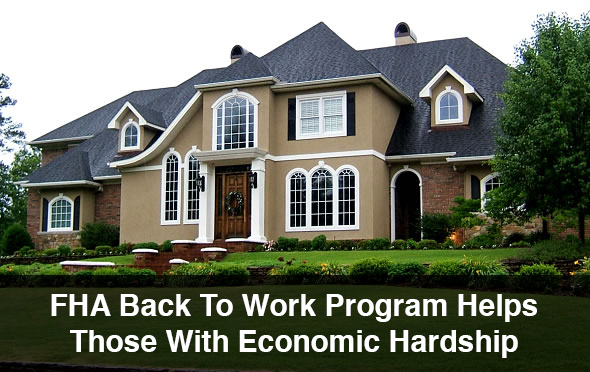 The FHA Back to Work program is a great option for these individuals to move on from their past and have the ability to become homeowners again. What’s The Best Loan For Your Mortgage Needs?